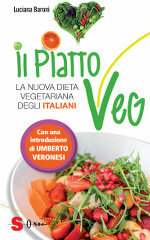 Published from 2015 to 2017 by Sonda Editions, the books of the VegPlate series are intended to give in-depth guidance on the healthfulness of a plant-based diet and its ability to promote optimal health at every stage of life. They are useful to everyone, even those who are not (yet) vegetarian, to learn how to move one's diet toward a healthier plant-based diet. The VegPlate was created by Luciana Baroni, M.D., specialist in Neurology and Geriatrics, with a Master's degree in Nutrition and Dietetics, and founder and president of Scientific Society of Vegetarian Nutrition-SSNV. A scholar of vegetarian nutrition and its health implications, she is the author of articles and books relating to health, nutrition and lifestyle. The book consists of three parts: the first dealing with the link between nutrition and health, explaining how what we eat can significantly affect unfavorably on the emergence of degenerative diseases or, conversely, help prevent them and, for some, even cure them. The second part introduces the various food groups of VegPlate and their nutritional characteristics, as well as useful information for the construction of an optimal plant-based diet, while in the third part examples are offered of simple and tasty weekly menus. With respect to this website, the book has much more data and insights: a reading helpful not only for the general public interested in healthy nutrition, but also for professionals who wish to develop expertise in the field of vegetarian nutrition. The vegetarian diet for mom and her little one: to demonstrate how a 100% vegetable is the best even in life stages including pregnancy, breastfeeding, and weaning. What happens to the mother and her baby during pregnancy and childbirth, and breastfeeding: what are the characteristics of foods to consume, how should they be used, what are the main notions about nutrients and lastly, how to make a vegetarian diet that is best for mom and baby. Everything you need to know to be able to benefit from a 100% vegetable diet from conception, for the mom and her baby, for the duration of pregnancy up to 1 year of age. 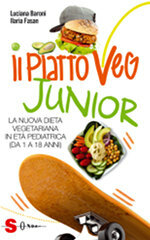 The third book in the VegPlate series covers the pediatric age group, from 1 to 18 years after weaning. Nutritionists Luciana Baroni and Ilaria Fasan take the parents by the hand and lead them to understand and put into practice the principles of a healthy plant-based diet for their children. But even pediatricians and all who are professionally involved in promoting diets for children can use the book to assist their vegetarian clients, individualizing the advice and recommendations contained in the pages of the book. With a style that is rigorous and yet accessible to everyone, from scientific sources, thanks to nutritional tables, figures and fact sheets, the authors deal with the theoretical and practical aspects of nutrition: from delicate stages in the development of the organism to the analysis of all the necessary nutrients; from the planning of the day’s meals to easy menus for all caloric requirements. 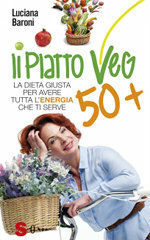 The fourth book of the series, "VegPlate over 50", helps us achieve and maintain perfect equilibrium, by showing us how our body works year after year, what disorders it can encounter, and how to deal with these with a low-fat vegetable diet. This latter diet includes all the foods of every food group (cereals, legumes, vegetables, fruit, nuts and oil seeds) with no need for drastic choices or sacrifices. In this manner, we will eat all the basic nutrients in order to give us a nutritional advantage and to counteract aging processes and certain pathologies, even in younger people. 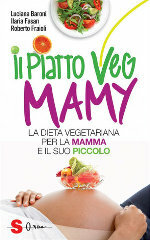 The book is further refined by the insights of nutritionist, Stefania Candilera, and obstetrician, Dr. Roberto Fraioli, and by 60 low-fat recipes, put together by Chef Alberto Berto.